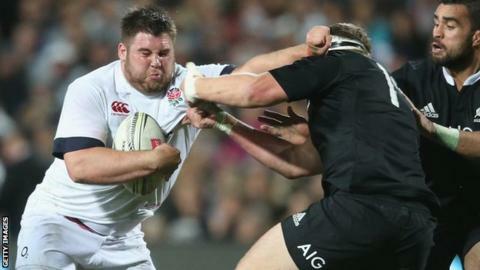 England prop Kieran Brookes will join Premiership champions Northampton Saints from Newcastle next season. The 24-year-old tight-head is expected to be a replacement for Salesi Ma'afu, who is reportedly joining Toulon. Brookes started his career at Newcastle in 2009, and after a two-year spell with Leicester, returned in 2013. "Kieran has steadily risen through the various England representative teams and has shown his quality at each level," said Saints boss Jim Mallinder. "However, while we believe that he can contribute a great deal to our squad, we also think that Kieran has a lot more to come, and we are looking forward to seeing him develop as a player at Franklin's Gardens." Brookes has six England caps, making his debut during last summer's Test series in New Zealand, and going on to feature in all four autumn internationals. "Northampton Saints' record over the last few seasons speaks for itself and I'm under no illusions of the quality of squad I'm going in to and the challenge that presents," he said. "I've really enjoyed my time at the Falcons. In the meantime all my efforts will be concentrated on helping us finish as high up the league as we can." Falcons director of rugby Dean Richards added: "We're obviously disappointed to see Kieran head to Northampton, as we would have liked him to stay here, at the club that has helped him to develop into the full England international that he is today. "Attempts were made to retain Kieran over a 10-month period, but during the course of the negotiations it became clear that he and his agent were looking to move."